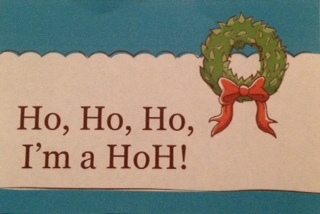 Ho, Ho, Ho, I’m a HoH! Q: At the start of every holiday season, what’s more common than cookie recipes and decorating ideas? A: Articles on how to survive the holiday season! They fall like snowflakes on social media, these survival-blogs that offer advice on coping with the annual issues of season – loneliness, depression, finances, family dysfunction, grief—and hearing loss. The last one is my particular specialty: I’m a HoH (hard of hearing). Along with other hearing loss writers, I create yearly Brace yourself, HoHs, here come the holidays!” pieces, including A Hearing Loss Letter to Santa, It’s Me Again, Santa – The Lady with Hearing Loss, Happy Holidays for HoHs, and last year’s popular Cheat Sheet for Better Holiday Hearing. Why do people with hearing loss need help with the holiday season? Simple: the powerful emotions of the season can turn painful when we struggle to understand things that used to give us joy. Holiday dinners are a nightmare trying to figure out who’s saying what, parties are noisy and people talk with their mouth full, and our family and friends often forget about/ignore our needs in the heat of their own holiday merriment. For some people, it’s stressful just thinking about what lies ahead in the holidays. We grieve for the music that we no longer hear, or in quite the same way. It’s lonely in the midst of a large party with jumbled words swirling around you like a winter storm. And family dysfunction happens real fast when the people you love, who are supposed to know better, chat away easily, including you out. To continue reading, this post, CLICK HERE.